Freelance photographer Leslie Parrott is based out of San Jose, CA, and local to the San Francisco Bay Area / Silicon Valley. She works on assignment for hotels, resorts, restaurants, industry leading magazines and brands, photographing architecture and interiors, food and beverage, product and lifestyle. Amba Products is a distributor of premium heated towel racks. Having shot product photography for Amba Products in the past, I was thrilled to take on this project in New York City. They had installed one of their premium heated towel racks in the rooms of Yotel Hotel in Midtown and were in need of shots that showed off their product within the space. There was going to be some press around it and they were looking for images that could be used for editorial as well as marketing efforts. I was connected with the marketing manager at Yotel and she was more than accommodating to let me photograph in a room. Yotel Hotel, known as a “micro-hotel”, prides themselves in small yet efficient, affordable and comfortable hotel rooms. I had never photographed a hotel room so small. I used a wide angle lens to capture the entire space and limited my setup. Instead of using a laptop tethered to the camera as I had done in past hotel photo shoots, I instead used a handheld iPad and shot wirelessly. This enabled me to put my camera and tripod up against the wall or window without having to stand behind it as well as not have a laptop on a stand nearby that could potentially get in the shot. I loved the ease of the setup so much that I now shoot in this manner for all interior photo shoots. Another challenge came up in post production - it was difficult to get the colors of the bathroom fixtures, wall and towel to be white but not so white that everything were to disappear. Whenever I have a challenge with color correction, I tend to fix it, then walk away, come back to it with fresh eyes and fix it some more. I do this several times until it is perfect. I am more than happy with the final photos portraying the all white bathroom. 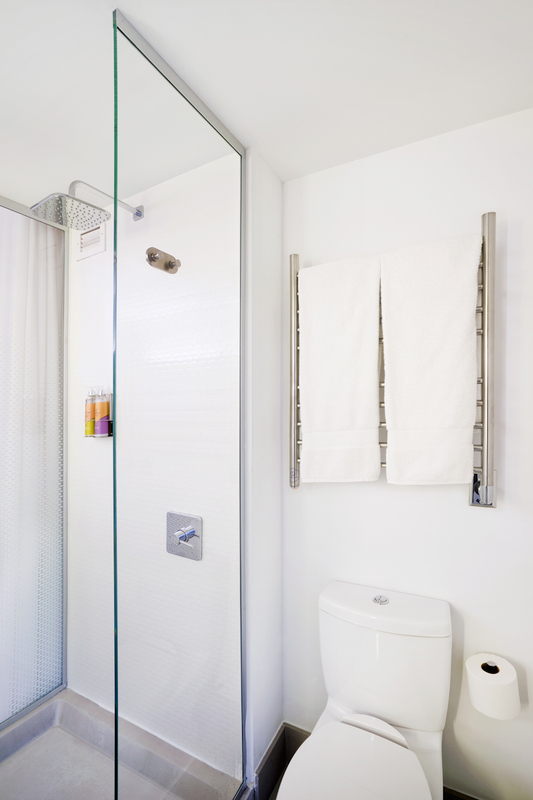 The client received a good variety of photos that told a story of the towel rack within the space. The photos highlighted their beautiful product and were used for the press release, editorial and marketing.